1 March 2014, Singapore – Two former champions, Karrie Webb and Angela Stanford head into the final round of the HSBC Women’s Champions at Sentosa tomorrowwith just one shot separating them. Australia’s Karrie Webb, winner in 2011, holds the slender lead over the Texan, who triumphed in Singapore in 2012, following a closely fought day that saw three players top the leader board at various stages of the round. At the end of the day it was the experience of Webb and Stanford that shone through, with both players finishing with a birdie. 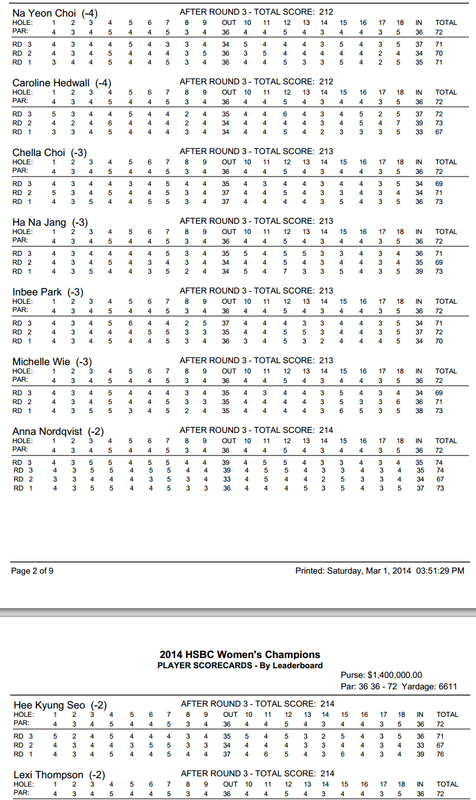 Webb carded a 2-under par 70 for the day, leaving her with an aggregate score of 11-under par. Starting at 7-under, Stanford went one better, shooting 3-under par to finish a single shot off the lead on 10-under. Sitting alongside her in the press room, Stanford said, “Well, first, I enjoy being here. I've said over and over, it's one of my favorite places outside of the States to play at. The sponsor treats us awesome, we stay at a great place, just has a home‑like feel. It's pretty laid back and it's just a fun city to be in. “You just have to be on your game, because I mean it's a limited field but anybody can win. I'd like to think anybody can win any week on our tour but when you only have 63 players, anybody can win. So you just have to bring your A Game every day,” added Stanford. Two shots further back from the pair is Azahara Munoz on 8-under par, who carded the best score of the day – a 5-under par 67 including an eagle on the par five seventh hole. Tied alongside her in third place is Taiwan’s Teresa Lu who had to settle for a 2-under par 70 for the day. 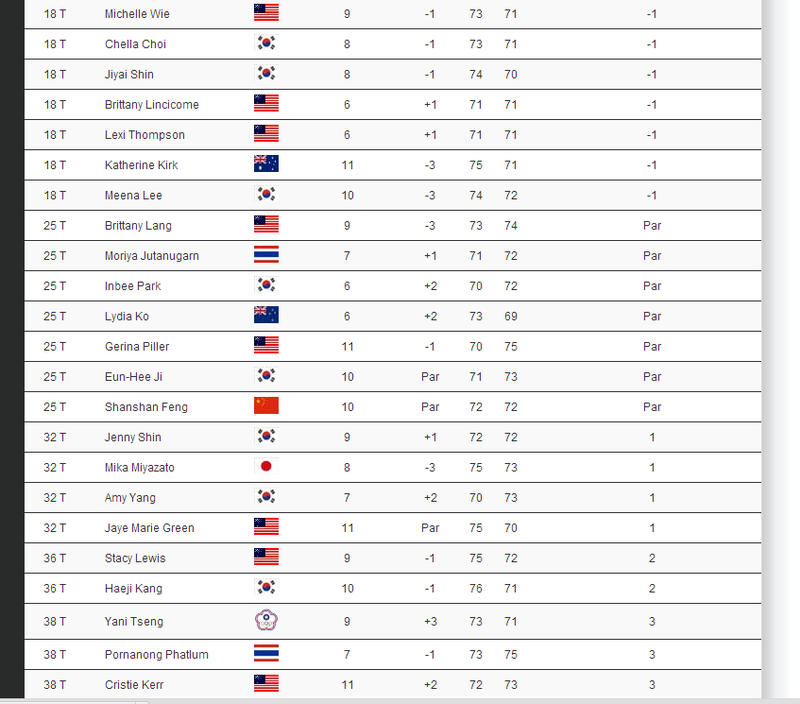 Another player that saw her name at the top of the leader board was Paula Creamer. The American led earlier in the day having shot three birdies on the front nine before dropping shots on the 10th, 13th and 16th holes, to finish the round at seven under par and in fifth place. Another player to have enjoyed a solid day was crowd favourite Michelle Wie who shot 3-under par for the day, leaving her tied in tenth place with an aggregate score of three under par, alongside the South Korean trio of World No. 1 Inbee Park, Chella Choi and Ha Na Jang. Meanwhile just three shots off the second last player in the elite field, is Singapore’s Amanda Tan who shot a respectable 3-over par today – a score that bettered a number of professional LPGA players. The fifteen year old Singapore Sports School student finishes the day with an aggregate score of 16-over par and in 63rd place. As the tournament heads into the final day, it’s clear that The Serapong is providing the players with a true challenge. The combination of slick greens, some testing landing spots on the fairways and breezy conditions on some of the seaward facing holes, continues to test the best with a number of big name players including Shanshan Feng (=33), Cristie Kerr (=39), defending champion Stacy Lewis (=42) and Ai Miyazato (60), struggling to find their form. 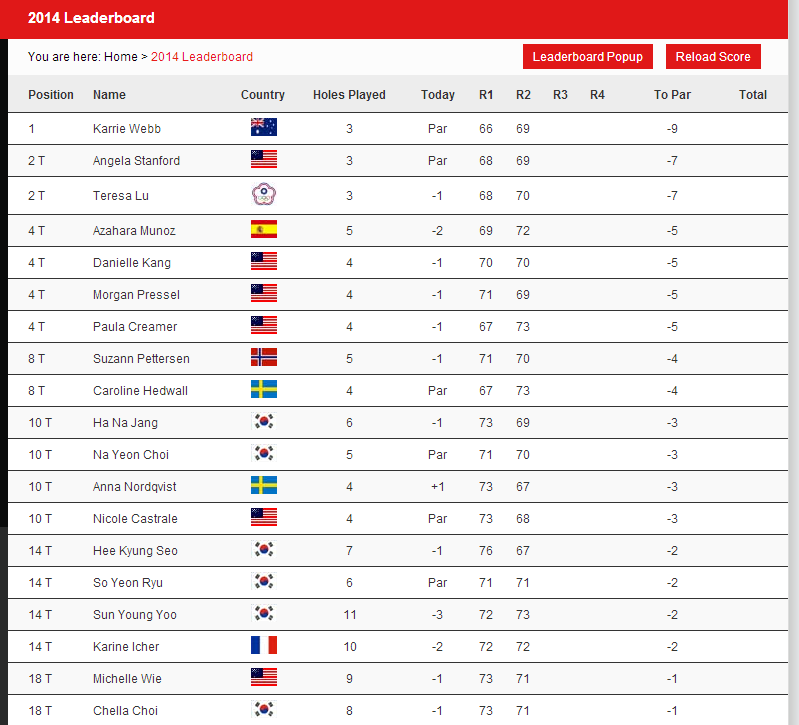 24 February 2014, Singapore – The field is now finalised for the 2014 Women’s Champions as 63 of the world’s leading female golfers from 18 countries arrive at the Sentosa Golf Club this week in Singapore to compete for a US$ 1.4 million prize purse and the opportunity to be crowned ‘Champion of Champions’. The 72-hole with no cut tournament has attracted 49 of the top 50 players from the Final 2013 LPGA Money List and 27 of the world’s top 30 ranked players from the Rolex Women’s World Golf Rankings. This year is also the first in the tournament’s history that the world’s top 10 ranked players will be competing in Singapore. The stellar field boasts no less than 437 career wins, 39 Major victories and 65 Solheim Cup appearances within it. Along with reigning Champion, Stacy Lewis, there are four past Champions in the field including Angela Stanford (2012), Karrie Webb (2011), Ai Miyazato (2010) and Jiyai Shi (2009). To ensure qualification for the prestigious event, players must either win an LPGA tournament in 2013 or finish in the top-20 in the Official Rolex Rankings (as at December 31, 2013). Places have also gone to Singapore’s local qualifier, 15-year-old Amanda Tan and sponsor invites Jaye Marie Green from USA and the second Chinese player on the LPGA tour, Janet Lin. Remaining slots have been allocated according to the 2014 LPGA Priority List, completing the stellar line-up in Singapore’s marquee golf event. The event promises a very strong international feel, featuring a host of American stars including Jessica Korda, Cristie Kerr, Paula Creamer and Lexi Thompson who will be joining fellow American and 2013 defending champion, Stacy Lewis. They will be up against other notable players from the region such as Japanese stars Ai Miyazato and Mika Miyazato and in-form South Koreans Inbee Park, Na Yeon Choi, Jiyai Shin and Se Ri Pak, and Anna Nordqvist, winner of the Honda LPGA Thailand at the weekend. The seventh edition of HSBC Women’s Champions is the fourth tournament on the 2014 LPGA Tour calendar, following the Pure Silk Bahamas LPGA Classic, ISPS Handa Women’s Australia Open and the Honda LPGA Thailand, and will tee off at Sentosa Golf Club from 27 February to 2 March.